As many of you know, last year the District Lodge 141 membership proposed, and the 2015 District Lodge 141 Convention delegates approved, many bylaw amendments. Those bylaw changes were then put to the entire membership for a referendum vote in December, 2015. One of the amendments approved by the membership changed the required number of Local Lodge endorsements to run for an elected District 141 Officer position from four to 10. 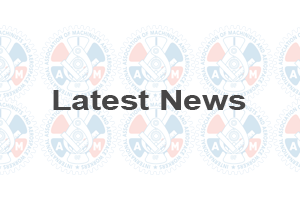 Despite the fact that this bylaw amendment passed overwhelmingly, the Department of Labor (DOL) has informed District Lodge 141 that the federal agency believes it violates the Labor Management Reporting and Disclosure Act (LMRDA). I realize this must frustrate many IAM members who feel their democratic right to vote on how their District should be run is being taken away from them. However, as President of District 141, along with the entire District 141 Executive Board, I feel it is imperative that we be in full compliance with federal law. Therefore, we will amend the District bylaws so that our great district is in compliance with the LMRDA. Then, all District Officer positions will be up for nomination and election in 2018 during the normal election cycle, and every four years thereafter. Most importantly, I am proud to say the DOL found no election violations, and absent their concern regarding the requirement to attain 10 local lodge endorsements, our locals conducted a flawless nomination process. In direct discussion with the DOL they made it clear that they did not need any protest to object to the increase. The DOL would have ruled we were not in compliance with LMRDA guidelines regardless. So, congratulations to all local lodge officers for running a well-executed nomination process.